It is usually the harlot that whispers from the alley, “Turn in here!” But beautiful Wisdom, Sophia, in the same way lures you toward the narrow gate. She invites the simple to the feast in her seven-pillared house. What is the purpose of this feast? Your own unveiling. Shedding mask upon mask and layers of false selves acquired over a lifetime, you find yourself undone by Wisdom until you yourself realize you are the host at the banquet. At the table you see that this is not just bread. Before you is the living bread come down from heaven. The jug contains living water springing up from eternal life. The feast spread before you is that eternal banquet outside of time hidden for now inside of time. And the dusty travelers at your table? Obviously, you are entertaining angels. “Jesus said to her (the Samaritan woman), 'Everyone who drinks of this water will be thirsty again, but those who drink of the water that I will give them will never be thirsty. '” (John 4:13-14) We have heard similar words from him about food: “Your ancestors ate the manna in the wilderness, and they died. This is the bread that comes down from heaven that one may eat of it and not die” (6:49-50). Living bread and living water: Jesus himself and that which he will give. There are resonances of the biblical wisdom literature here, reminding us once again that Jesus is himself the wisdom of God. In the course of this sexth day, John is developing the immanent, “feminine” mode in which this divine wisdom will be present when Jesus has been glorified. 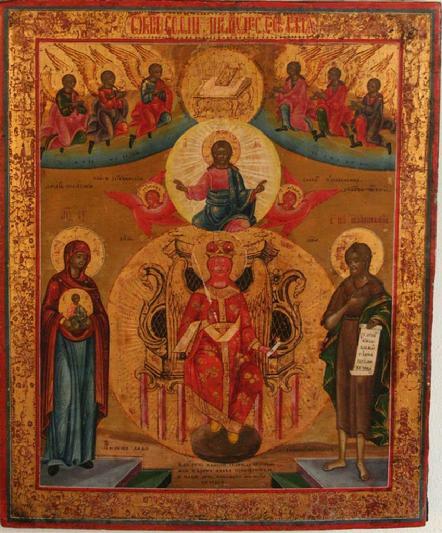 On the left, Wisdom in white, enthroned in unknowable holiness, surrounded by moving wheels and cherubim (red), and angelic hierarchies (green and brown). Mother of God in mandorla on the right. Solomon leans from balcony with text of Proverbs 9. Disciples of Wisdom help prepare and enjoy the feast. The slaughtered cows evoke the Eucharist. Seven vessels of wine are on the table. Above, seven angels represent the gifts of the Holy Spirit. 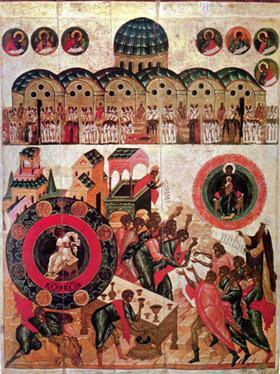 The seven domes represent the seven ecumenical councils (between 325-787). Wisdom has built her house, she has set up her seven pillars. She has slaughtered her beasts, she has mixed her wine, she has also set her table. She has sent out her maids to call from the highest places in the town, "Whoever is simple, let him turn in here!" 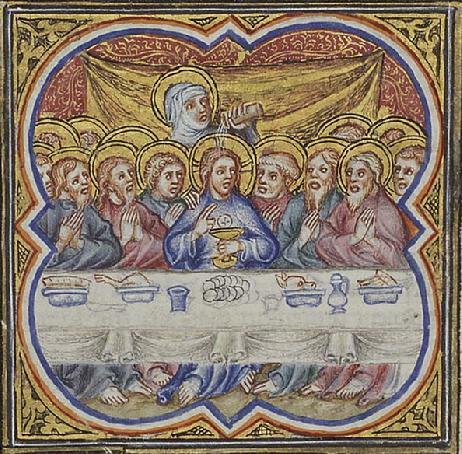 To him who is without sense she says, "Come, eat of my bread and drink of the wine I have mixed. Leave simpleness, and live, and walk in the way of insight." The color red represents the fire of the Spirit. Both angel and queen, dressed in priestly garments Sophia sits upon a throne evoking the Temple – notice the seven pillars. The circle around her represents the impenetrable mystery of God. In some Sophia icons this circle is more complex and pronounced. Mary, carrying the Christ is on her right, and John the Baptist, the forerunner, is on her left. Above the Christ is the Hetoimasia, the throne of Judgment upon which Christ will sit at the end of time. Do you know the difference between our Father Abraham, peace be with him, and Lot? Why does such a spirit of satisfaction pervade the story of how Abraham set before the angels curd and milk and tender calf? Did not Lot also bake for them and give them to eat? And why is the fact that Abraham received them in his tent regarded as so deserving an action? For Lot also asked them in and gave them shelter. Now this is the truth of the matter: in the case of Lot it is written that angels came to Sodom. But concerning Abraham, the Scriptures say: "…and he lifted up his eyes and looked, and lo, three men stood over against him." Lot saw angelic shapes, Abraham poor, dusty wayfarers in need of food and rest. If it were only a symbol, I’d say to hell with it. I am not worthy, Master and Lord, that you should come beneath the roof of my soul: yet, since in your love toward all, you wish to dwell in me, in boldness I come. You command, Open the gates – which you alone have forged; and you will come in with love toward all, as is your nature; you will come in and enlighten my darkened reasoning. I believe that you will do this: for you did not send away the harlot who came to you with tears; nor cast out the repenting publican; nor reject the thief who acknowledged kingdom; nor forsake the repentant persecutor, a yet great act; but all of those who came to you in repentance, you counted in the band of your friends, who alone abides blessed forever, now, and unto the endless ages. quoted from The Oxford Book of Prayer, George Appleton, ed. O Lord! thy blessings hang in clusters, they come trooping upon us! They break forth like mighty waters on every side. And now Lord, thou hast fed us with the bread of life: so man did eat angels' food: O Lord, bless it: O Lord, make it health and strength unto us; still striving and prospering so long within us until our obedience reach the measure of they love, who hast done for us as much as may be.